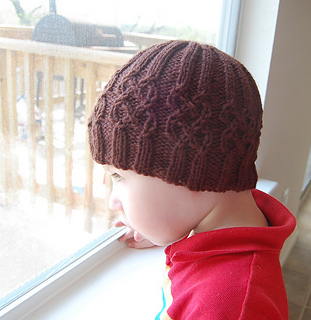 When the Fall 2006 issue of Knitty came out, I fell in love with Sherwood and desperately wanted to make it for my son. 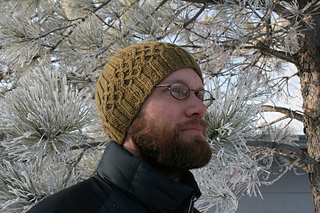 Unfortunately, at the time it was beyond my skills and confidence as a knitter. Now, a year later, I’ve decided to give it a try - but first, I wanted to practice a little bit and get familiar with the cable pattern used on the sweater. This hat gives plenty of opportunity to practice - and it’s a nice way to get cables to go around the head without having to work sideways. 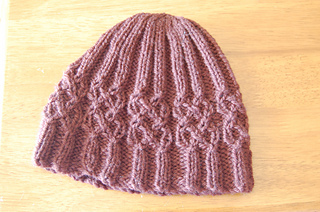 To avoid going crazy on some of the cable rounds, I recommend checking out a tutorial on cabling without a cable needle. Edit Dec 03 2007: There was an error in the cable chart and directions which has been corrected. If you have a copy of the pattern downloaded before this date, please download a new copy of the corrected file.